AT&T has started pushing out a new update to Samsung Galaxy S7/S7 edge smartphones on its network. 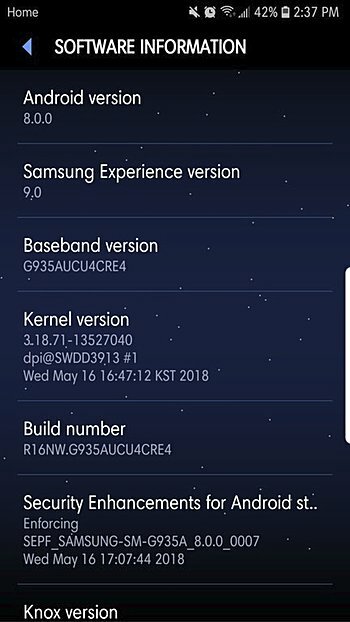 Arriving as G930AUCU4CRE4/G935AUCU4CRE4 and weighing in at around 1.8GB, it's a major update that brings along Android 8.0 Oreo OS. This makes AT&T the first US carrier to roll out the update given that Verizon has pulled its update again. As is usually the case with OTA roll outs, it might take time for the update notification to pop up on your screen, so be patient. John, I cannot thank you enough. Checked and downloaded it, everything is smooth. Kudos man ! Took away all my text messages tones hate it cant tell who is texting me. All the icons are moved didn't like that either.